Seven years ago, Louis Tomlinson burst onto the global stage as one fifth of the worlds biggest boy band. 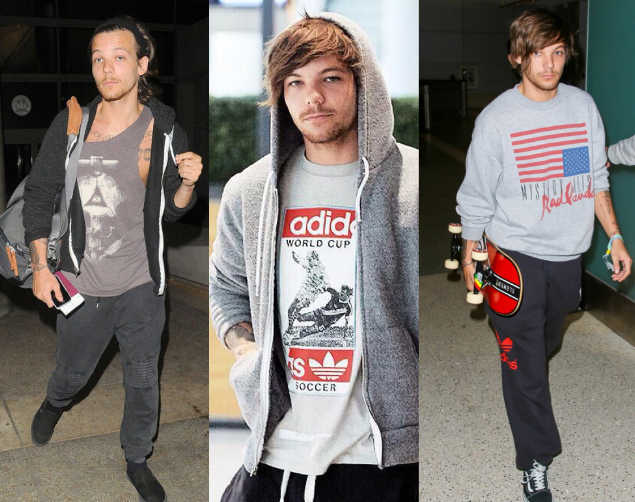 From the early days of braces, Toms, and stripes to his current blended style of Gucci, Vetements, and Adidas, Louis has taken us on an intriguing fashion journey. Stripes and braces may not seem like cool fashion choices in 2017, but for a boy band member in 2010 they definitely were. Whilst what he wore was heavily guided by the stylists that worked with the entire band, few could have convincingly carried off the look as well as he did. As time progressed, outside of the band and in his own personal time, we started to see a different look emerge. Swapping fitted jeans and button-ups for comfortable sweatpants, sweatshirts, hoodies and tank tops. New brands also appeared, with a clear favorite being Adidas as it is still is today. In recent years, the hoodies have remained, now often paired with skinny jeans. Louis has also started to mix his aesthetic, weaving designer clothes into his wardrobe with maximum effect. Since the hiatus began, we have been treated to many more amazing looks. As can be seen in the middle and right images below, the promo tour for 'Just Hold On' has been particularly good to us. Here's to many more years of watching his fashion style evolve. It's definitely a journey we're enjoying.